Rising senior chemistry major Ryan Agh spent ten weeks working on the chemical synthesis of certain enzymes, to create an amino acid analog that contains heavy atoms, so that his classmate, rising junior biology major Ambrose Rice, would be able to incorporate them into proteins. The students’ passion for this concept, one in which some may find difficult to comprehend, set them apart from other students interested in working under Belmont Chemistry Professor Dr. Duane Hatch at the Department of Energy’s Visiting Faculty Program. 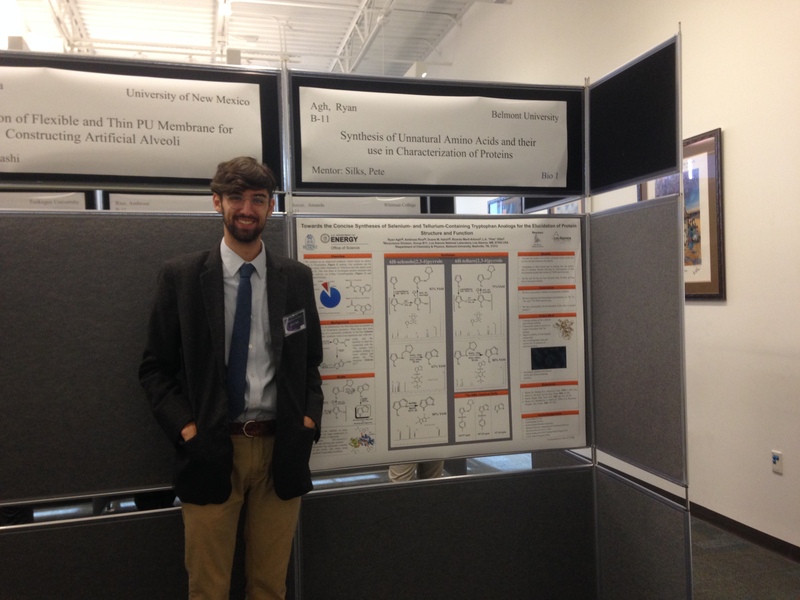 At the culmination of the summer, the duo presented their research at the 15th Annual Los Alamos National Laboratory Student Symposium, where Agh took home first place for his poster (pictured above). The students explained the reasoning for their research – to expand the unnatural, synthetic amino acid tool box for scientists to further explore protein structure and function. The heavy, or electron dense, atom helps instruments to better “see” the protein structure and its function. There are a number of applications that immediately affect the general public, but the main purpose of this project was to aid scientists and industry, overall. For Agh, one of the most meaningful parts of the summer was successfully completing experiments. “My most memorable moment was when I first successfully used the NMR (nuclear magnetic resonance), and hit a spectrum that even Dr. Hatch was proud of. That meant not only that I used the instrument correctly, but also that my synthesis formed the correct product, and I purified it well by myself!” said Agh. Both students have plans to return to Los Alamos National Lab before they start their journey into graduate and medical school, working toward PhDs. Agh went on to say he wants to spend time traveling after graduation before finishing school, but would love to teach and research at a school like Belmont. “I think the ability to inspire and excite young minds to pursue a career in science would be the most rewarding career I could have,” he said.